Update 19 May – The Woodpecker is Back! 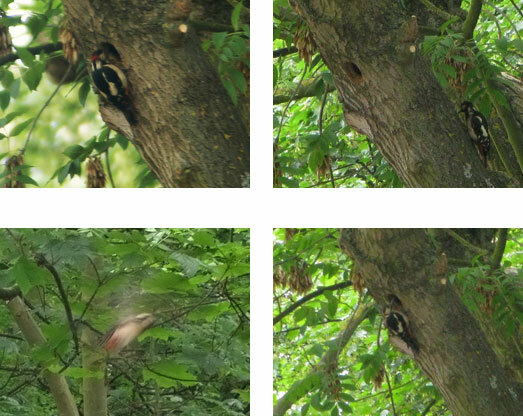 The Great Spotted Woodpecker has been spotted (!) in the wood. Local residents have followed the drilling noise to a tree on the outskirts of the wood next to the car park. There is a perfect round hole forming in the trunk of the tree. This is great news as the silver birch tree that the woodpecker was fond of, fell over in the midst of the freezing winter. Attempts to photograph the bird have so far failed so in the meantime here’s another RSPB illustration. Not only has the woodpecker returned, but it’s brought a mate and is currently rearing chicks in its nest inside the tree! These lovely birds can be seen flying around Dog Kennel Hill Wood as they collect food for their young. The council tree surgeons doing work on Champion Hill Estate got within 20cm of the nest with their saws before a member of the Friends alerted them to the nest. Males have a red patch on their heads as well as near their tails whereas females only have red near their tails.